Discover the delicious world of chocolate and cocoa at the Salon du Chocolat, which returns for its sixth edition at Tour and Taxis from 22 to 24 February. The most indulgent weekend of the year offers a packed programme of events, from demonstrations and workshops to chocolate pairings and a fashion show. Boasting more than 130 stands, the international trade fair and gourmet event is an opportunity to meet the makers of your favourite pralines, chocolate bars and cakes. Chocolate producers will be present from countries as varied as Peru, the Dominican Republic, Cameroon and Madagascar. Many exhibitors are artisans who are part of the bean-to-bar movement that is revolutionising the industry in the pursuit of flavour. And this year’s theme reflects the trend. Patricia Raes, the spokeswoman for Salon du Chocolat, explains the reasons for the choice of Tasty and Natural: Nature offers something to suit all tastes. “We are going more and more now to the source. Many chocolatiers make their own chocolate instead of buying it. That way, you know the origin. It’s very different and many of them will be at the chocolate fair,” she says. Visitors can listen to talks by some of Belgium’s inspiring master chocolatiers, attend conferences on chocolate and cocoa and enjoy chocolate pairings with beer, coffee, wine, whisky and rum, as well as trying their hand at creating their own confections at chocolate workshops. In addition to the activities for adults, the fair offers fun for children, with workshops at Chocoland specifically designed for a younger audience. 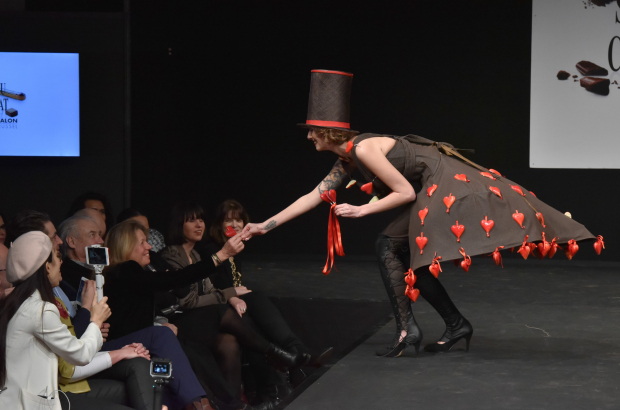 The traditional catwalk fashion show on Saturday and Sunday at 17.00 is a chance to see dresses composed of chocolate elements that fit this year’s nature theme. Each creation is signed by a designer and chocolatier. The event’s opening evening on Thursday is an opportunity to enjoy a preview of the fair. Tickets for this VIP experience are €20 and will help raise money for Télévie, an organisation that funds cancer and leukemia research for adults and children. Tickets can be bought in advance until 21 February at midnight, but will also be available at the door. While the fair is an annual highlight of Brussels’ gastronomic calendar, the city is a mecca for all things chocolate. Fans in search of a permanent fix, should check out Choco Story, a museum dedicated to the sweet stuff where you can learn about the history of chocolate, taste samples and watch demonstrations. The museum runs guided tours, while other culinary trips around Brussels’ chocolate hotspots are also available at visit.brussels. Shoppers are spoilt for choice in the capital with a tempting selection of speciality stores and boutiques. For originality and less packaging, try an artisan range available in local patisseries and delis. Recommended independent names include Frederik Blondeel, Laurent Gerbaud, Zäabar Factory Shop, Van Dender, Pascal Chanson, Vandenhende, Jerôme Grimompon. Otherwise, the traditional brands, from Leonidas, Godiva and Neuhaus to stylish newcomers such as Marcolini, are guaranteed to hit the sweet spot. Sorry! Our free ticket giveaway has now closed and the winners have been notified.